Achieve a sleek, salon-worthy finish with L'Anza Keratin Healing Oil Smooth Down Spray; an anti-static formula that works to calm and tame hair from root to tip. Powered by Keratin Protein and the brand's signature Phyto IV Complex of four restorative botanical oils, the weightless spray combats frizz and flyaways, whilst softening and nourishing hair for improved manageability. 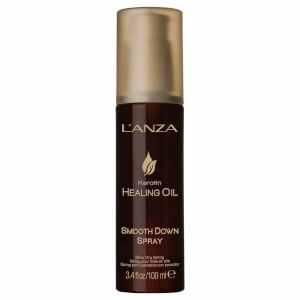 Delivers thermal protection to shield from heat styling damage. Expect glossy, radiant locks and reduced drying time.